At Least He’s Still Got His Winning Smile: Check Out Sammy Sosa’s Shiny, New, Light-Colored Skin. Oh, my goodness: What is happening to retired Chicago Cubs right-fielder Sammy Sosa’s face? The above photo shows Sosa on the left at a May 2009 People Magazine event. The right is Sosa, who retired in 2007 with 609 career homers, earlier this week in Las Vegas for the Latin Grammys. Ebony…to ivory…in a mere six months? 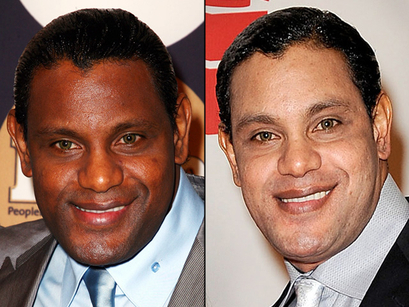 While neither Sosa or anyone close to him has addressed the change in skin tone, baseball bloggers are speculating that it could be some cosmetic lightening process or worse, a side-effect of using performance enhancing drugs – although there appears to be little to no evidence that steroid use can lead to skin lightening disorder such as vitiligo. In June, the New York Times reported that Sosa tested positive for a banned substance in 2003. In other words, I suspect that, like many self-denigrating Negroes, Sosa has decided to go whole hog with the Prince Charming look; the one that the late Michael Jackson strove so hard to achieve in his lifetime. I mean, I’m hoping it’s that, and not that he’s not well. But, if it isn’t, he’s not well. I heard that both MJ and Sosa had vitiligo, and the most popular way to “treat” that in black people in severe cases is to lighten the rest of the skin so the blotchiness isn’t as prevalent. Chicago Tribune talked to one of his friends, who attributes his appearance to a “skin rejuvenation process” and says that photo is misleading because of the lighting. It’s true that some cosmetic procedures and chemicals used for damaged skin can cause discoloration, and I’ve seen some hi-def pictures of Sosa that suggest he’s got a lot of sun damage. On the other hand, I don’t think the photo is that misleading. The full version shows him with his wife, who looks about the same as she always does. There is a slight blanching effect from the lighting, but if you compare the shot with earlier pictures of the two together, it’s obvious he has become far, far paler. Sammy has confirmed that he uses a skin-lightening cream. But damn, he looks horrible!